Guidebooks and Maps: The Long Trail Guide is a large, thick, heavy guidebook that no one we met on the trail was actually carrying. It’s also the only source of mileage data that we could find, though the data is spread throughout the book one page per section. I wish I had thought to use my smartphone to shoot a photo of each data page for quick reference on the trail. For this hike I made a mileage spreadsheet and added every piece of data that I could find, creating my own mini-databook which I printed and laminated into small cards for easy use on the trail. The guide does have a lot of specific information on campsites that we could have used. 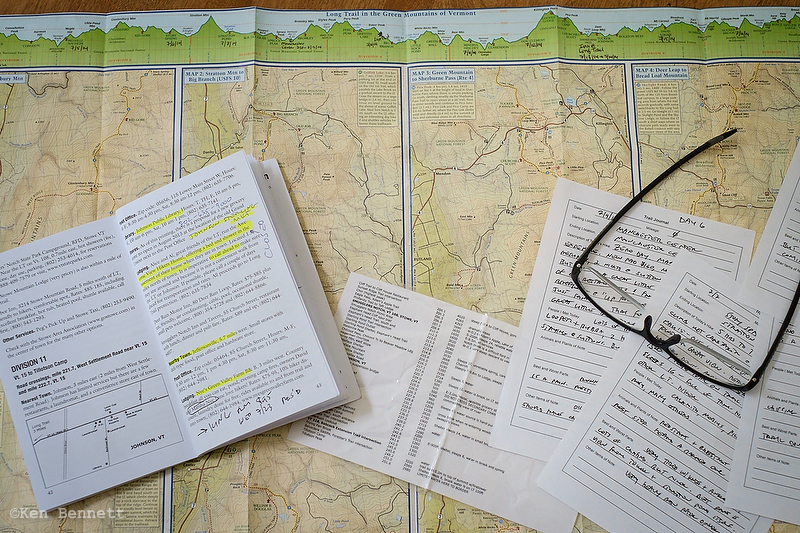 The End to Enders Guide is a smaller book with the sort of town data that thru-hikers need. It does have useful information, though it doesn’t compare to the two most popular AT thru-hikers guides. A thru-hiker should carry this book, and perhaps write in additional information before and during the hike. The Long Trail Map is excellent. Easy to read and use, with mileage data between most points and a fairly accurate elevation profile. This is absolutely required for a thru-hike. It did take me awhile to get used to the 1:100,000 scale, as I am used to 1:24,000 maps. What looks like an easy jaunt on the LT map is actually 4 times longer than I expect because of the scale. Getting to the Southern Terminus: We took Amtrak’s The Vermonter from Washington, DC, to Amherst, MA, then had a shuttle from there to North Adams, MA. The train was fantastic — much easier than driving, cost about the same for two people, and we didn’t need to leave our car for a month in a random parking lot. There are several shuttle providers in the area who can help with this shuttle. We chose to stay at the Holiday Inn North Adams, which was friendly and clean, and only two miles from the AT trailhead on Rt. 2. The hotel was able to provide a ride to the trailhead in the morning, otherwise there is a city bus on weekdays or it should be an easy hitch. We chose to hike the Appalachian Trail to the terminus, rather than the Pine Cobble Trail, though either will work. Getting home from the Northern Terminus: The guides suggest that this is difficult, but we found it fairly easy. After finishing the trail, we backtracked 2.6 miles south on the LT to the Rt 105 trailhead and hitched a ride west to the small town of Richford, VT. There is a restaurant and tavern there, The Crossing, that rents a few inexpensive rooms. The folks at The Crossing were very hiker-friendly, and the food in the tavern was much better than we expected in such a small town. Dinner in particular was fairly fancy and the service was excellent. Oh, and they have Long Trail Ale on draft! The local transit authority runs a weekday commuter bus at 5:30am from Richford to St. Albans, VT, where the Amtrak station is the northernmost stop of The Vermonter train to Washington DC. We got on the early bus, grabbed a nice breakfast at a local coffeeshop in St. Albans, and easily made it to the 8:58am departure from the Amtrak station two blocks away. Lodging in Vermont: we spent one or two nights at local inns or B&Bs in several trail towns. All of these are mentioned in the E2E Guide, along with contact information. Sutton’s Place, in Manchester Center. Sutton’s Place is like staying at your grandmother’s house. It’s a nice place, slightly worn, comfortable without being fancy. Frank Sutton is a really nice guy and has great advice on where to eat and shop in town. We had a zero day here, and thoroughly enjoyed the town. The Inn at Long Trail, at Rt 4 right on the trail, is a Long Trail and Appalachian Trail institution. We paid less than $100 per night for two people, which included a wonderful breakfast each morning. The inn has an Irish pub with great food and a nice beer list, decent small rooms, and it’s an easy ride on the bus down into Rutland for resupply. We had another zero day here. The Hyde Away Inn, in Waitsfield. The Hyde Away is a small country inn, restaurant, and tavern. The food is local farm-to-table, well prepared and delicious, and the small craft beer tap list is excellent. The room was small but had a private bath, and breakfast was included in the price. Hitching from Appalachian Gap was easy. If you visit Waitsfield, make sure to stop at The Mad Taco for delicious Mexican street food and terrific local craft beer — try anything from Lawson’s! The Old Stagecoach Inn, Waterbury. This is a cute Victorian lodging house in downtown Waterbury, very close to restaurants and grocery stores. The reasonable rate included a terrific breakfast outside on their lovely porch. We had a large room with a private bath. Nye’s Green Valley Farm, Jeffersonville. This was an amazing bargain at less than $100 per night for two people including a terrific homemade breakfast. It’s a beautiful location, and the owners drove us anywhere we needed to go. We took our final zero day here. The Crossing, Richford. This is a small restaurant and tavern that has a few rooms for rent. It’s quite inexpensive, and the room was clean. Food and service in the tavern were well above our expectations — try the roast beef sandwich — and they prepared excellent steaks for a celebratory dinner. This one is not in the guidebook but should be. Resupply: We did almost all of our resupply in local grocery stores, with one small mail drop that we probably didn’t need. Manchester Center: The Price Chopper had a good selection for long term resupply, and there is a small health food store across the street with bulk granola and the like. The Mountain Goat outfitter is excellent, and there is an Eastern Mountain Sports in the same shopping center as Price Chopper. All are walking distance from Sutton’s Place. Rutland: many large groceries from which to choose. We went to Tops, which was fine for resupply. We also bought some food items at the Rite Aid – always check the big drug stores for hiking food items. The bus went to town every hour. Waitsfield: the Shaw’s grocery is small but had a terrific selection. It was a fairly easy hitch into town from App Gap. Waterbury: The Village Grocery store was the best of the entire trip. Great selection and only a couple of blocks from the inn. Johnson: The Johnson Sterling Market was hard to figure out – they were missing several items that we like to purchase, had very limited selection of others, but they had terrific freshly baked sourdough bread and a nice deli. As it’s the only option, we made it work. We ate regular hiker food: Pop Tarts or granola or Nutella for breakfast, cheese and crackers with salami or sausage for lunch, and a Knorr pasta or rice side dish for dinner, usually with a bag of chicken, tuna, or bacon. My new favorite trail meal is the Knorr Broccoli Alfredo pasta side with a bag of real bacon bits for a backcountry pasta carbonara. Bonus points if you bring butter and parmesan cheese. We ate a lot of bars: breakfast bars, Clif and Kind bars, Nutri-grain bars, Snickers bars, along with fair amounts of trail mix, and we tried to find pretzels or Combos or some other savory snack as well. We drank a lot of Gatorade, using the single-serve packets. This helps me prevent leg cramps at night. We also enjoyed various iced tea drink mixes, Starbucks Via packets for breakfast and cold afternoon coffee, and decaf green tea with our dinner.